From afar it seems like it can’t be much, this movie about a king who stutters. It sounds like that other indie film about a disabled King and the attentions to his impediments, about the ministrations of subjects and the vanity and fallibility of royalty, a very narrow, Shakespearean thing indeed. 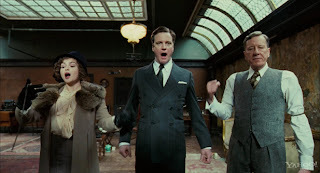 But with its fine performances – Geoffrey Rush, Colin Firth, and Helena Bonham Carter should all be remembered at Oscar time – and its perfectly written, tidy three-act script – The King’s Speech delivers what is oftentimes the hardest thing to do: a straightforward, well-told story, rich with many layers of meaning. The movie opens in the late 1920’s, with the invention of radio and the imperative that King George as well as his two boys – the older David, and the younger Bertie – deliver a radio speech to the subjects of the realm. The problem is that Bertie has a stutter…such a severe stutter that he’s unable to utter nary a word of his speech, both to his own mortification and the embarrassment of his father. His wife, Elizabeth, deeply feels Bertie’s humiliation. Seemingly the one person in the family who wasn’t born to – but has mastered – the protocols of royalty, she seeks out to discretely, and with proper disarming etiquette, find Bertie some help in the speech department. First, I have to pause and say that I love this role for Carter. Typically a Harry Potter witch or Tim Burton harpie, it’s exciting to see her open up and play a person of grace and magnanimity, albeit with her typical wry wit and breezy ministrations. She’s playing against type, and it makes the performance all the more interesting. In fact, Rush and Firth are also playing against type – as we shall see – and this may be one thing that imbues such a seemingly simple story with so much tension. From here out, however, I must note a SPOILER ALERT. If you haven’t seen the movie, I suggest you skip now to the end if you want the plot to remain a surprise. When Elizabeth does encounter Rush’s Lionel Logue - a speech therapist (don't you love the name "Lionel Logue" for a speech therapist?) who advertises an unconventional manner – it takes a bit of convincing, as he recognizes her royal highness right away. He will only take on the prince as a client if he’s allowed to do his typical treatment, which is to essentially treat Bertie not only as an equal, but as a friend, as well. So the first thing that The King’s Speech does is turn typical class distinctions on their head. It’s prince Bertie who is bone-headed, stubborn, and ungrateful, while Lionel needs to show both the patience and perseverance of the better man. In essence, Bertie is not only taking speech lessons from Logue, he’s also learning how to be a better King. This is where both Rush and Firth play against type, with the normally stand-up Firth needing to show flashes of anger and impetuousness (as well as hidden royalty, ready to be shaped) and Rush bringing the type of humble, middle-class, confident “menschness” that one would hardly expect from the man who plays characters like Pirate Barbosa. It’s a good thing that Bertie is taking these lessons, too, because something else is going on in the background of this story: the rise of Hitler, and the approach of World War Two. If the country goes to war, a great King is going to be needed. Unfortunately, Bertie’s older brother – David – isn’t up to the task, something which becomes all too clear when he starts taking up with a loose American woman who has sympathies with the Nazi party. If we know anything of history, and even if we don’t, we can see where this affair is going to lead Bertie. Yes, Bertie’s overbearing father eventually dies…and David abdicates the throne…all on the eve of the outbreak of war. So Bertie is to be sworn in as King, though his lessons with Lionel have hit something of a snag. And this is how something as simple as conquering a stutter becomes a stand-in for the heroic efforts that all men are called upon to perform in trying times such as these. Bertie has his own calling – to deliver the speech that will buck up and galvanize the nation – and his own inner demons to conquer in doing so. He’s found a willing partner in Lionel, if only he can see past his own class prejudices and personal demons to accept his help. Thus the double meaning of the title. The King’s Speech is not only the manner of his stutter, but also the text of content that he must deliver to an anxious nation. That speech could easily determine Britain's ability to endure the blitz. In this way, then, the King’s determination to conquer his stutter is symbolic of a nation’s courageous efforts to endure the war. His acceptance of Lionel compared to David’s impetuous marriage to a commoner symbolizes the conflicting ways in which Britain begins to emerge into a modern, less classist age. And there are many other things, to boot – too many for a simple movie review. That’s a lot for a little movie ostensibly about a stutter, told in an unpretentious, classic three-act style. But this movie carries it all off without a flaw, shining a light on this fascinating time and this interesting man. Come Oscar time, I expect it to carry at least a Royal flush of nominations.